Homemade greetings cards are really special and show the recipient that you’ve thought about it rather than just buying a mixed box of cards off the shelf. 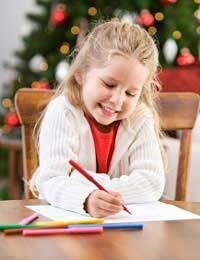 Getting your child involved in making a Christmas card can be a fun project for both of you, and using a computer will mean that you can make multiple copies quickly and easily so you, and your child, can concentrate on getting the design just right. Within their chosen theme talk about what their focus will be. For example, if they’ve chosen a nativity scene do they want to show the final tableau or just an angel? Depending on the age of your child you might need to give them a specific framework. For very young kids draw an outline (or download one from the Internet) for them to decorate. Pre-schoolers will probably enjoy colouring their outline with pens or crayons; you can then scan it in to format it for printing. School age children can use basic graphics software to arrange pre-set shapes on a page. Teach them how to make circles, squares and festive shapes like holly (if you don’t have a graphics package you’ll find these shapes in most word processing packages). They might decide they want to take a festive photograph to use as the centrepiece for their design rather than a ‘drawing’. Check out the effects that your photo editing software has, there might be options to frame the images or change colours or add things like snow. Let your child play around with the software to experiment with different options. It’s all very well spending hours drawing a perfect picture or designing a great Christmas motif but it’s no use if it just stays on the computer. Decide if you want to send paper or digital Christmas cards (or a mixture of both) and format accordingly. If you want to email your child’s Christmas masterpiece make sure that the file size is small enough to send. If they used graphics software to produce the design, save it as 72dpi to minimise the file. If possible save it as a PDF; Acrobat Reader is free to download so everyone who gets it will be able to view your artistic attachment. All his is important detail for your child to learn but will probably only make sense to children of ten and above. To print the card, talk your child through formatting options. What size do they want it to be and how do they want their image positioned? Do they want borders or should the image take up the whole space? Bear in mind that most domestic printers will have a limit to the thickness of the paper they can take so for really good quality cards consider taking your finished work to a local printers to have them printed. Hopefully you’ll ed up with a Christmas card that you and your child will be proud of, and you’ll both have learnt some new skills while you were making it.